Breaking News: Hammerstein Museum Fundraising Extension! DOYLESTOWN, PA (12/19/18)- The Friends of Oscar Hammerstein, the county-wide, community-led initiative launched this summer, is pleased to announce that it hasnegotiated an extension with both Doylestown Township and the developer with an interest in the property and now has more time to continue raising the funds needed to save Oscar Hammerstein’s Highland Farm from the dreaded subdivision. The past year has seen many exciting efforts focused on raising funds to preserve “The Farm” as a museum. 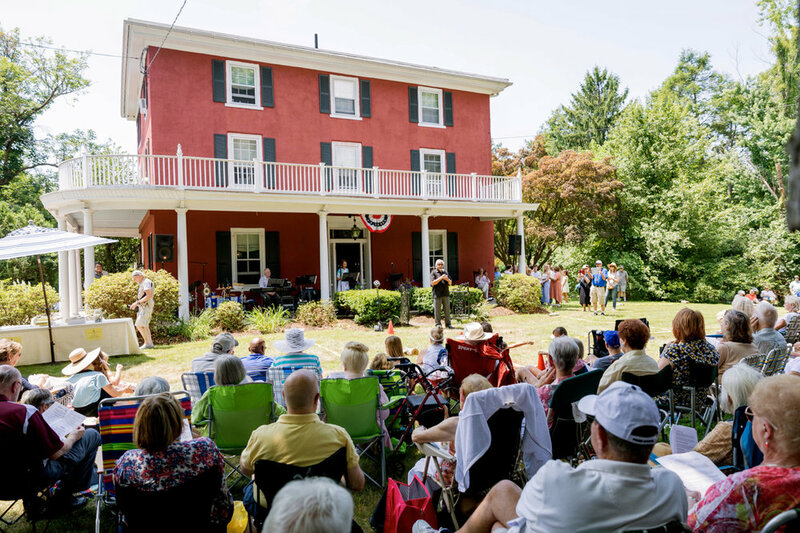 In July, well over 400 people attended the collaborative outdoor “Sing!”performance on the Farm’s front lawn, serving as a perfect stage to many local supporters and artists. With a new campaign in place designed by Axis Visual in Doylestown, the “Friends of Oscar Hammerstein” committee has raised over $50,000, attracting a mix of social media and private donations, community events such as Dine & Donate nights, Save the House Bike Tours by Encore Rides, an Oscar Night Cocktail Party with professional Broadway performances, and fellow-non-profit programing partnerships, among other initiatives. A live-streaming program on Facebook, entitled“Live from Oscar’s Living Room,” has generated over 45,000 views in a matter of weeks and a new sponsor, further leading to other upcoming sponsorships. In other encouraging developments, Doylestown Township has generously granted an extension to file preliminary land plans to November 2019 and the Arts and Cultural Council of Bucks County donated their 2018 Giving Tuesday efforts to help ensure the future of Highland Farm as an iconic Bucks County landmark. Other exciting plans with partners are in the works, leading the committee to anticipate a successful campaign in 2019! With the threat of a 4-lot subdivision looming, The Oscar Hammerstein Museum & Theatre Education Center, a recognized 501(c)3, is in the process of raising funds to purchase, restore, and preserve Oscar’s Hammerstein’s former home and workplace at Highland Farm in Doylestown, PA. The goal is to create the “Hammerstein Center,” a multifaceted, dynamic museum experience with a strong theater education component that will serve as a place of inspiration for Broadway fans and humanitarians alike, from Hammerstein’s backyard and throughout the globe.